Myrtle rust is a serious threat to the nursery and garden industry, forestry, tea tree oil production and natural ecosystems. It’s found in Northern Territory, Queensland, New South Wales, Victoria and Tasmania. If you think you have seen it anywhere else in Australia, call 1800 084 881. Myrtle rust attacks young, soft, actively growing leaves, shoot tips and young stems, as well as fruits and flower parts of susceptible plants. The first signs of myrtle rust infection are tiny raised spots that are brown to grey, often with red-purple haloes. Up to 14 days after infection, the spots produce masses of distinctive yellow spores. 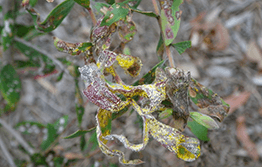 Myrtle rust has been detected in many places on the eastern seaboard of New South Wales, Victoria and in Queensland. It has also been found in Tasmania. If you are travelling out of an area where myrtle rust has been detected, do not carry Myrtaceae plant material with you. Many states have restrictions on the entry of plants in the Myrtaceae family and this includes that nice bunch of flowers you may be about to purchase at the airport! Check this website for permitted movements and, if still unsure, check with the destination state before moving plants and cut flowers interstate. The same applies to those lovely flowering gum seedlings you saw on Ebay last night. You must check whether these are permitted entry into your state before purchasing! Failure to do so may put industries and the environment at risk. NEVER move plants or plant cuttings into or out of bushland areas.